On a lovely early Fall day I headed to Sookmyung Women's University in the Yongsan area. This campus is quite lovely and set atop a hill near a park. If you ever get the time I would suggest exploring this area as there are many restaurants, cafes and dessert shops nearby. I came for the event Seoul Cambridge Day XII, as suggested by the KOTESOL organization. This event brought together teacher's and professionals to hear lectures on Cambridge materials and teaching methods. These days I know I need to learn and use more Korean. Especially when someone asks me, "How long have you been in Korea?" To which I say, "Four years now." And then the usual response is, "Oh! You must speak Korean very well!" Sorry, not really. It's a sad fact that clouds my life here in Korea, but don't get the wrong idea. I know how to read Korean very well and have a good bag full of phrases and sentences I can use to get by. I understand most of what people say around me, but as far as conversation and full understanding that is still yet to be accomplished. So I have decided to try out language exchange happenings through group meetups. I found one such group through Meetup.com, and it looked promising. They have several locations you can go join, and I was pleased to see one open up near me in Hyehwa. The view: A crowded urban exterior in the place called Itaewon. Back in my home country I can easily go to the store and get a rice mix to take home. You know one of those "Spanish" or "Mexican" ready-made rice mixes that you just throw in a pot with some water, and you're done. Not really the case in Korea, where rice mixes tend to lean more towards a Korean flavor. In this case, I realized that I should just try to make the same thing but from scratch. 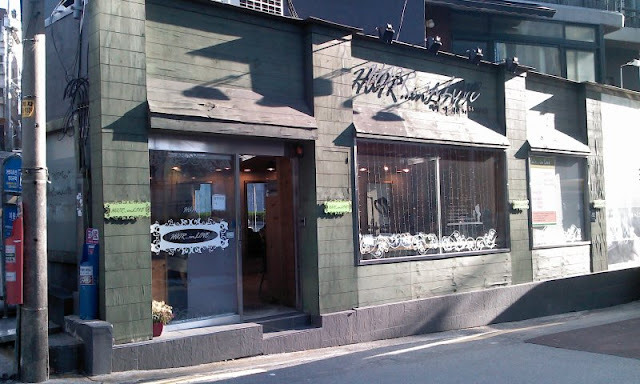 On the way to Jankura Art Space, in Itaewon, you can enjoy walking past many antique shops. Some of which look like hold actual antiques while others just seem like old furniture stores. My Thoughts on the "Korean Wave"
There has been a lot of chatter around the Kblogosphere about how The Girl's Generation went on David Letterman and possibly spoofed themselves. Some say it is not helping the "Korean Wave" advance itself across the ocean, and others give them props for trying. I for one say that this stunt isn't going to help Americans get to know Korea in the way that I know Korea. To me Korea is a place full of unique pop culture and historical trademarks. The food is amazing and you can't go wrong with a country that eats live octopus. But Americans don't know much about Korea beyond whatever they have in their mind. Without any scientific background to prove this, I bet most Americans (off the street) will associate S. Korea with North Korea and all that hoopla. Gallery Golmok, in Itaewon has put together another compelling show. This one being their first for the 2012 year, and so got off to a start with a buzz of artists and voyeurs. This show titled, "Homo-Sapiens" is going on till February 15th. Features several artists all wrapping their talents around the theme of a species that has changed throughout time and also a touch on what it means to live in a world heavily populated (as to what I have gathered). First a few pictures of walking down the new cafe-shopping street on my way to the gallery. One could go to Butterfinger Pancakes or some brunch place, but the best pancakes are homemade and enjoyed with a friend. Yesterday, I ventured over to my friend's place. She recently moved to my area and so we were excited we could get together so easily. I brought over a Red Mill Organic pancake mix I bought from a foreign food online seller, along with frozen blueberries. We picked up a few extras, too.